If you are ordering more than 1, you will enter quantity of 1 each time and complete the information for each individual toy. A mock up will be sent via email for approval before production. This adorable elephant is customized to display your love and pride for DST. Makes a great crossing/neophyte gift or a gift for a seasoned soror for any occasion. These items are customized and can not be refunded and it will be imperative to review the mock up that will be sent via email and approved before your item will go into production. NOTE: Items WILL NOT go into production until the design mock up has been approved! Once the mock up is approved, It Just Got Personal will not assume the responsibility of any errors unless an error is indicated prior to production and the change was not corrected by It Just Got Personal during production. There are no design changes that will be made to ensure timely production of each customized item purchased through this website. If there is a special request to be made, you must email info@itjustgotpersonal.com to request a custom order. A $5 design fee will be added to the listed price and you will receive an invoice via email that must be prepaid before the production of your item. ***Due to the expected volume It Just Got Personal can not guarantee delivery by Christmas. Please allow 1-3 days of production before your order may be shipped. 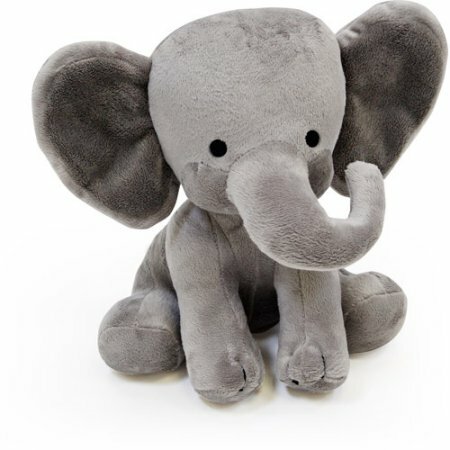 The plush elephant is made from 100 percent polyester and is easy to clean. This item features black button eyes, big ears and a curved snout. It comes in a beautiful gray color and is very soft and cuddly. The plush stuffed toy is made with quality fabric and workmanship, so it is sure to last for a long time to come. It can be used as a decorative piece in a child's nursery.